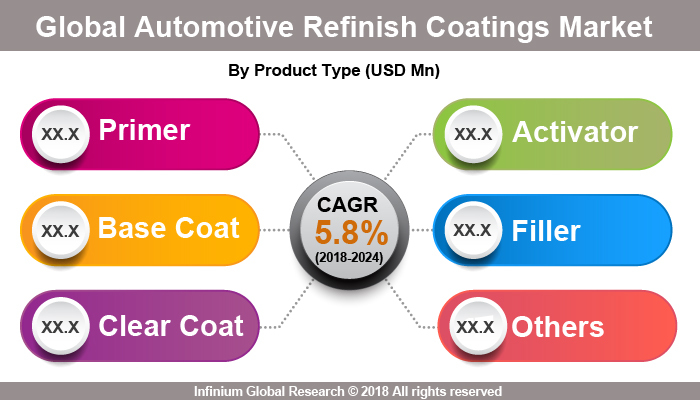 A recent report published by Infinium Global Research on automotive refinish coatings market provides in-depth analysis of segments and sub-segments in global as well as regional automotive refinish coatings market. The study also highlights the impact of drivers, restraints and macro indicators on the global and regional automotive refinish coatings market over the short term as well as long term. The report is a comprehensive presentation of trends, forecast and dollar values of global automotive refinish coatings market. According to the report the global automotive refinish coatings market is projected to grow at a CAGR of 5.8% over the forecast period of 2016-2024. Automotive refinish coating market are used in automobiles for protection against external factors such as extreme temperature, stones, damage due to accidents and similar to others. Automotive refinish coatings are used by the automotive body shops and repair centers for refinishing the vehicles. They are mainly used to enhance the appearance and durability of a vehicle by protecting them from external factors such as temperature and UV radiation is an essential requirement. Car accidents, a car smash and accidental car bumps during the parking are the common problems owing to which car’s body and paint are damaged. Thus collision repair and auto painting have to be done in order to remove dents and scratches from the cars. Also, many consumers are emotionally attached to their cars and do, timely repair and maintenance of their cars. These aforementioned factors are responsible for driving the growth of the market. In addition, adoption of rising disposable income in the developing economies is boosting the growth of passenger vehicles which in turn to benefit the automotive refinish coatings market. However, increasing government regulations on the utilization of high volatile organic compounds (VOC) level coatings is likely to restrain the growth of the automotive refinish coatings market. Furthermore, the development of eco-friendly technologies and increase in the number of car owners and car rentals are anticipated to create several growth opportunities for the key players in the automotive refinish coatings market over the years to come. Among the geographies, North America dominated the automotive refinish coatings market followed by the Asia Pacific region. The growth in the North American regions is due to the tendency of owners to undertake timely repairs of their vehicles and high disposable incomes are encouraging the automotive refinish coating market in the North America regions. Moreover, the growth in the Asia Pacific region is due to the high demand for refinishing coatings in developing countries such as India and China. On the other hand, China holds a dominant position in the used vehicle market and has a high expansion rate and thus requires the refinish coats to refurbish the cars. The report on global automotive refinish coatings market covers segments such as product type and technology. On the basis of product type, the global automotive refinish coatings market is categorized into base coat, primer, activator, and clear coat. On the basis of technology, the global automotive refinish coatings market is categorized into solvent borne coatings and water borne coatings. The countries covered in the North America region includes the U.S., Canada, and Mexico; while Asia-Pacific includes China, Japan, India, South Korea, Malaysia, and among others. Moreover, Germany, U.K., France, Spain, and Rest of Europe are included in the European region. The U.S. drives the growth in the North America region as it is the largest market in the region. The Asia-pacific region offers substantial potential for the market growth owing to rapid growth in markets such as India and China. The APAC region is projected to experience growth at a CAGR of x.x% over the period of 2016-2024. The report provides profiles of the companies in the global automotive refinish coatings market such as The Valspar Corporation, Sherwin-Williams Company, PPG Industries, Nippon Paint Holdings Co. Ltd, Donglai Coating Technology, KANSAI PAINT CO., LTD, BASF SE, Axalta Coating Systems, Akzo Nobel N.V, and 3M. The report provides deep insights on demand forecasts, market trends, and micro and macro indicators. In addition, this report provides insights into the factors that are driving and restraining the global automotive refinish coatings market. Moreover, IGR-Growth Matrix analysis given in the report brings insight into the investment areas that existing or new market players can consider. The report provides insights into the market using analytical tools such as Porter's five forces analysis and DRO analysis of automotive refinish coatings market. Moreover, the study highlights current market trends and provides forecast from 2016-2024. We also have highlighted future trends in the automotive refinish coatings market that will impact the demand during the forecast period. Moreover, the competitive analysis given in each regional market brings insight into the market share of the leading players. This report will help manufacturers, suppliers, and distributors of the automotive refinish coatings market to understand the present and future trends in this market and formulate their strategies accordingly.